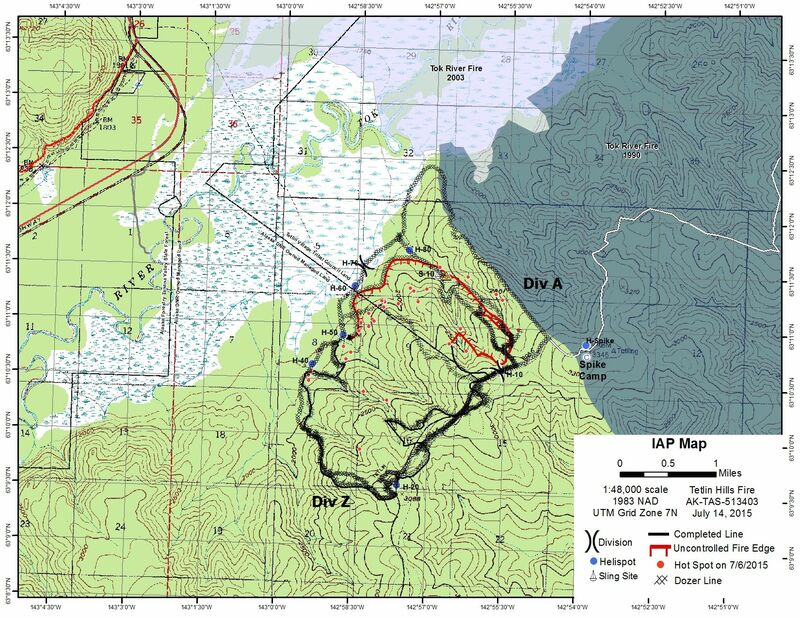 (Tok, AK) – Firefighters on the Long Lake and Tetlin Hills fires continued to make progress on containment lines yesterday. As operational objectives are met, crews are being reassigned to areas of priority. The Chisana Fire is reported at 39, 110 acres and will remain in monitor status. Tetlin Hills Fire — The Tetlin Hills Fire received precipitation throughout the night. The current and forecasted weather conditions will hamper access and delay mop-up operations created by the extremely steep, wet and slick conditions. Despite the challenging conditions, fire personnel are making good progress with the cooler temperatures and higher relative humidity. Containment is now at 60 percent, up from 50 percent yesterday. Two Alaska crews will be reassigned from the Tetlin Hills Fire to the Long Lake Fire. Work today will be concentrated on the North end of the fire. Fire personnel will continue to mop-up, grid and secure the fire line. Currently 230 firefighters are working on the Tetlin Hills Fire. Long Lake Fire – Four crews worked the northern perimeter yesterday strengthening the containment line on the Long Lake Fire. Aviation resources have arrived to the fire to provide crews access of remote cultural resources and provide bucket support. The Tanana Chief Crew scouted the western flank for helispot locations to advance operations south to Andrew Lake. The containment line is currently 20 percent confining the fire from threatening the village of Northway. Firefighters continue to mop-up around the VOR facility and rehabilitation of the indirect dozer line near Moose Creek. Currently 110 firefighters are working on the Long Lake Fire.